To purchase the eGift card, add the eGift card to your basket. When your order has been processed and we have taken payment you or the recipient of your order will receive an email (within 48 hours from the time of purchase) containing a link to the purchased eGift card. New Look accepts no responsibility for the customer inputting the incorrect email address to which the eGift card should be delivered. eGift cards may be exchanged for goods of a higher price than the face value of the eGift card on payment of the difference. If you do not spend the entire balance on the eGift card the remaining balance will be updated after each transaction. If any product purchased with an eGift card is subsequently exchanged for a product of a lower price or a refund, any money owing will be added to the remaining balance on the eGift card. eGift cards have a maximum value limit of £250. eGift cards can be topped up to that maximum value limit. eGift cards will be valid for 18 months from the last transaction (transactions include balance enquiries). Any remaining balance will be cancelled on expiry of the validity period. Please check online for balance enquiries or contact us by phone on 0500 454 094 (local rates apply but please note mobile rates vary). eGift cards cannot be exchanged for cash or used towards payment of any outstanding balance on a New Look Store Card. Please treat eGift cards as cash. New Look will not accept liability for lost, stolen or damaged eGift cards. New Look reserves the right to amend the terms and conditions or eGift cards at any time and to take appropriate action, including the cancellation of the eGift cards if, at its discretion, it deems such action necessary. This does not affect your legal rights. 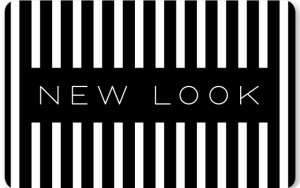 A favourite on the UK high street amongst fashionistas and the style savvy everywhere - New Look is that go-to place for all of your outfit desires. Men, women and teens alike will appreciate a New Look gift card, giving them the chance to update their wardrobe no end with all of the season’s must-haves. For your everyday work wear, a night on the town, or even a relaxing evening at home - you’ll find every element you need to create the perfect look here. Shop by season collections and holiday edits, your favourite denim, loungewear and occasionwear too, there are countless ways to enjoy using a New Look gift voucher. Designing clothes for a wide range of styles and sizes too, you can find a bountiful selection of maternity and plus size wear at New Look. Stay on trend and complete your outfits with an incredible offering of shoes and accessories galore - finding your style really is a breeze with New Look. To use your eGift card in store, simply print out and present at the till - you do not need your PIN. For your convenience, your eGift card can be cut out and stored in your wallet. To spend your eGift card online, please enter the 16 digit card number at the checkout, selecting the gift card option at payment. You will need to enter your PIN.